The new John Hansard Gallery opens in May 2018 within Southampton's new Cultural Quarter. The renowned John Hansard Gallery will officially open in its new purpose-built home at Studio 144 in Southampton City Centre on 12 May 2018. In advance of the official opening of John Hansard Gallery, Studio 144 will launch with Southampton Celebrates on 16 February 2018 in collaboration with Southampton City Council, Nuffield Southampton Theatres and City Eye. The Gallery’s programme in Studio 144 will highlight the rich diversity of contemporary art, from emerging talents to celebrated international figures, from solo projects to historical surveys, and from painting, sculpture and photography, to film, performance, installations and digital media. The long awaited move, from the Gallery’s historic home at the University of Southampton’s Highfield Campus to the new purpose-built Studio 144 in Southampton’s Cultural Quarter, triples the space available for public programming, community-focused projects and active learning opportunities. The arts venue comprises around 75,000 square feet of stunning gallery, performing arts and film/media studio space across two iconic buildings, as part of a mixed-use development. The city-centre Gallery will dramatically increase opportunities for the public to experience and be inspired by great art, as well as for creative collaboration with its new cultural neighbours in Studio 144 – City Eye and Nuffield Southampton Theatres. Satvir Kaur, Councillor, Southampton City Council, says: “I am excited to welcome John Hansard Gallery to the heart of our city’s cultural quarter. Southampton is on a journey to becoming the cultural destination in the region, and the opening of Studio 144 is set to put us on the map. With the creative industries being one of the biggest contributors to the UK’s economy, I am pleased Studio 144 will be creating hundreds of local jobs and attracting thousands to our city every week. 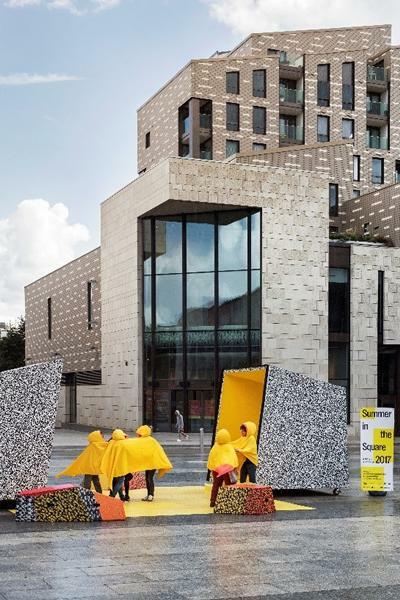 Phil Gibby, Area Director, South West, Arts Council England, says: “The opening of Studio 144 and relocation of John Hansard Gallery is a moment of unprecedented opportunity for Southampton and the region. We are delighted to support John Hansard Gallery through our National Portfolio funding programme. Their curatorial work is exceptional, showcasing some of the most incredible artists of our generation, and they are an amazing platform for young and emerging artists. The opening exhibition – part of ARTIST ROOMS – demonstrates the Gallery’s capacity to draw artists of national acclaim to the region. John Hansard Gallery is funded by Arts Council England. The development of Studio 144 is led by Southampton City Council and supported by the National Lottery through Arts Council England, in partnership with Grosvenor Britain and Ireland Developments Limited.